NOTES: curbside, like most Entex car kits. Introduced at the 1978 Monaco Grand Prix, the WR-5 replaced the WR-4 and WR-1cars of the Walter Wolf GP team. The WR-5 was powered by a 475 HP Cosworth engine and competed in 10 Grands Prix. The #20 car was driven by later 1979 World Champion Jody Scheckter. In 1975, the Slovenian-Austrian-Canadian businessman Walter Wolf had started to appear at many of the F1 races during the season. A year later, he bought 60% of Frank Williams Racing Cars while agreeing to keep Frank Williams as manager of the team. Simultaneously Wolf bought the assets of the Hesketh team that had recently withdrawn from F1. The team was based in the Williams facility at Reading but used most of the cars and equipment once owned by Hesketh Racing. The Hesketh 308C became known as the Wolf-Williams FW05 and soon afterwards Dr. Harvey Postlethwaite arrived as chief engineer. Jacky Ickx and Frenchman Michel Leclère were hired to drive. The team, however, was not very competitive and failed to qualify at a number of races during the year. Leclère left after the French Grand Prix and was replaced by Arturo Merzario while Ickx failed to perform and was dropped after the British Grand Prix, to be followed by a string of pay-drivers. At the end of 1976, Wolf decided that the team needed restructuring. He removed Frank Williams from the manager's job and replaced him with Peter Warr from Team Lotus. Disillusioned, Williams soon left the team, taking Patrick Head and several others to set up Williams Grand Prix Engineering. Postlethwaite's WR1 was a conventional Cosworth package but with Jody Scheckter hired from Tyrrell, the new-look team presented a strong package. No-one, however, expected that the team would win its first race in Argentina. It was in many respects a lucky win with Scheckter starting tenth with six of the cars ahead of him retiring. During the 1977 season, Scheckter went on to win the Monaco Grand Prix and the Canadian Grand Prix and also six other podium finishes which enabled him to finish second to Niki Lauda in the World Championship and gave Wolf fourth place in the Constructors' Championship. The team remained the same for the 1978 season. Postlethwaite produced the WR5, a new car for the ground-effects era. This did not appear until the Belgian GP. Scheckter finished fourth in Spain and second in Germany but the WR5 soon made way for the WR6 with which he ended the year with a third in the US Grand Prix and second in Canada. He finished seventh in the World Championship. In 1979, Scheckter was signed up by Ferrari and Wolf signed James Hunt to replace him. Postlethwaite designed the WR7 which ran with Olympus sponsorship. The car was not very successful and retired more than 7 times during the first half of the season. The WR8 soon followed. In mid-season Hunt decided to retire and Wolf quickly hired Keke Rosberg to replace him. 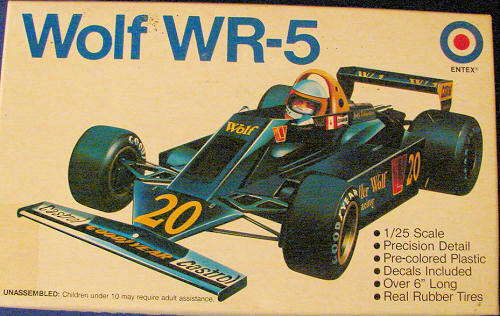 The appearance of the WR9 did little to change the team's fortunes and at the end of the year Wolf grew tired of his F1 adventure and sold the team to Emerson Fittipaldi, who merged its assets into Fittipaldi Automotive. This particular kit is dated 02/80 and I’m not sure if it’s ever been re-released or reboxed. It is molded silver and black with a one-piece body. I didn’t see any flash or ejector marks and the molding looks quite crisp. Detail is good, but both the top of the engine and the drivers’ body are molded into the top of the body. Medal axles are provided for the wheels and it has working steering. The instructions are a single sheet, printed on both sides. There are 8 illustrated steps with assembly directions. Decals are quite complete for this car but are very yellowed. 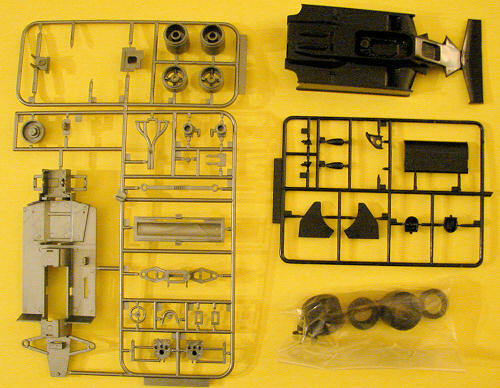 The way the kit is assembled as well as the look of some of the parts, leads me to think that at one time this kit may have had some type of motor installed or was intended for use as a slot car. It has what appears to be a battery door in the bottom of the chassis. While simple and not quite as detailed as a modern F1 kit, with a bit of work you can build a very nice WR-5 with this kit. Besides, until something better comes along, this is the only way to get a model of the Wolf WR-5. New decals would be nice, but I know of no A/M decals for the WR-5 in this scale. 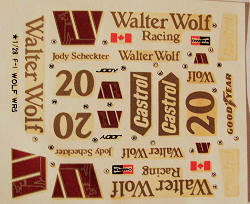 Indycals does make a set of 1/25 Wolf Racing decals for the 1978 WR-1 that could possibly supply new team markings.